Fisheries managers have long known that the population of rainbow smelt in the Great Lakes is on the decline. Once so abundant that they could be fished out with a pot or strainer, this important prey fish survives today in numbers hovering near historic lows. Numerous causes for the falling population have been proposed, but new research suggests that the population patterns and the forces driving them are more complicated than previously believed. The 2014 study reveals that number of smelt that survive their first few months has actually been on the rise since 2000. But this increase in hatchlings isn’t translating into more adults, and it is unclear when and why that breakdown is happening. Whatever the cause, the loss of adult rainbow smelt is enough keep the population trending down even as offspring survival improves. Researchers from USGS, IISG, Purdue University, and the U.S. EPA Great Lakes National Program Office, discovered the unexpected increase in offspring after analyzing roughly 40 years of fisheries data using a novel modeling technique. Fish populations are typically analyzed using a statistical model that that assumes the relationships between different variables—things like number of offspring, number of adults, degree of predatory pressure, and amount of rainfall—remain the same over time. For this study, researchers used statistical tools rarely used by fishery scientists that better reflect the ever-changing nature of the Great Lakes and make it possible to detect more subtle population patterns. Perhaps most surprising is that offspring survival is on the rise in Lake Michigan despite the fact that their parents are up to 70 mm shorter now than they were in the 1970s. Researchers speculate that the drop in the number of adult smelt may actually be allowing hatchlings to thrive. 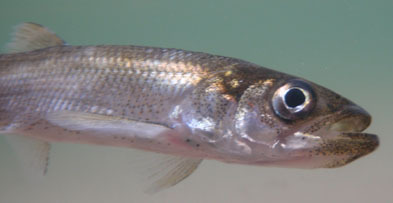 Adult rainbow smelt frequently supplement their diet of zooplankton by dining on their offspring. Fewer adults means fewer predators for juvenile smelt. The need to find food in a lake infested with millions of quagga and zebra mussels that filter out plankton may also be driving adults further out into the lake and away from spawning grounds. ***Photo courtesy of Crystal Lake Mixing Project.